Beatrice was the daughter of Henry F. & Bessie F. "Redden" Hoke. Married to Roy Edward Jones. Roy was the son of Joseph and Carrie Armstrong Jones. The following obituary was taken from the Beckley Post Hearald dated August 15, 1972. Mrs. Beatrice Mabel Jones, 60, of Meadow Creek died at 11:30 a.m. Monday at her home. Death was attributed to an apparent heart attack. 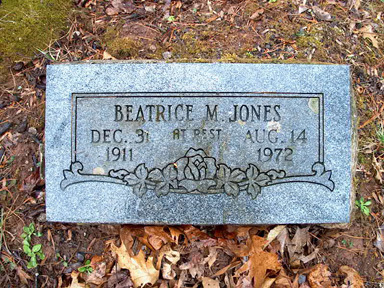 Born at Meadow Creek, Dec. 31, 1911, she was the daughter of Mrs. Bessie Hoke and the late Henry F. Hoke. She was a member of the Meadow Creek Baptist Church. Other survivors include her husband, Roy E. of Meadow Creek; three sons, Edward and Eugene of Hinton, and Shirley R. Jones of Georgetown, Tex., and three sisters, Mrs. Elmer Richmond, Mrs. Bill Bleau and Mrs. Charles Richmond, all of Meadow Creek. The body is at the Ronald Meadows Funeral Parlors in Hinton.